University of Alabama-Birmingham head football coach, Bill Clark, is not a household name, but that does not mean he is not an excellent coach. UAB eliminated their football program after the 2014 season, but the death of the Blazers’ football program did not last a full offseason. This article is not exploration of the Curious Case of UAB Football; this is an exposé of why Coach Bill Clark’s coaching career and potential cannot be lost to the travails of the UAB football fiasco. Although virtually unknown to most college football fanatics, the fans of Alabama high school football have bandied about the name “Bill Clark” for years, and justifiably so. After all, Coach Clark amassed a 106-11 record as head football coach at Prattville High School, and that included back-to-back state championships. From there, Clark left the high school coaching ranks for college football. As the defensive coordinator, Clark helped to build the University of South Alabama (USA) football program. Upon USA’s completed transition to the FBS, Bill Clark got his first opportunity as a head college football coach, returning to his alma mater, Jacksonville State (of the FCS). Going 11-4 at JSU, Clark had the highest winning percentage of any first-year JSU coach since Jim Fuller in 1977- back when Jacksonville State was a Division II program. After just one season with the JSU Gamecocks, Coach Clark accepted his first head-coaching job at an FBS school, UAB. *Only Watson Brown’s final four seasons at UAB were used for this calculation. Using MOV ATS reveals just how great a coach Bill Clark is. He exceeded public expectations by more than two field goals PER GAME. 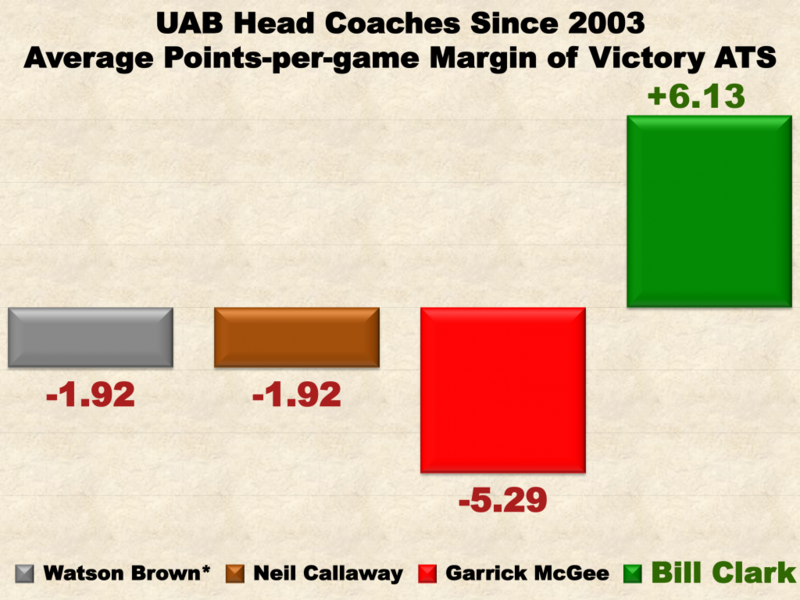 The three UAB head football coaches who preceded Clark all had negative MOV ATS. Dismantling the UAB football program right when Bill Clark was just getting started was a tremendous disservice to the near-certain improved future of Blazer football. Now that UAB football has been slated for resurrection (although exactly when and in what league have yet to be determined), the best thing for Blazer football would be to keep Bill Clark. Without a doubt, UAB will do just that. After all, when was the last time UAB made a bad decision about its football program?